Hand volumizing with results lasting up to 12 month. At Renew Aesthetic Clinic, we use Radiesse or Radiesse (+) mainly for hand volumizing with good results lasting up to 12 month. Radiesse (+) has 0.3% lidocaine added for patient comfort. We do not overcorrect (overfill) a contour deficiency with these products. 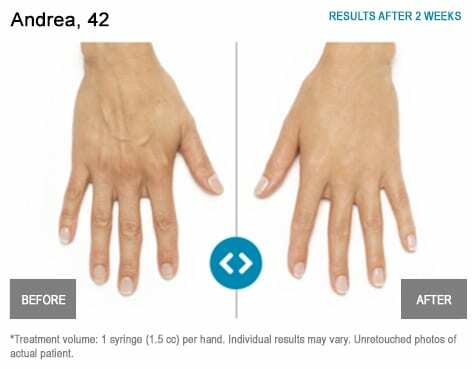 Injection volumes over 3 cc of RADIESSE ® per hand in a treatment session. RADIESSE is a dermal filler that temporarily adds volume to help smooth moderate to severe facial wrinkles and folds, such as nasolabial folds (the creases that extend from the corner of your nose to the corner of your mouth) as well as to help restore hand volume. Once injected, RADIESSE plumps the skin to give the appearance of a smoother surface. Over time, RADIESSE works to stimulate the body to produce collagen naturally. 1 Ultimately the body absorbs the product and leaves behind the natural collagen for long-lasting results. Please Note: This form is not intended for communication regarding protected health information. Dr. Yan’s passion for natural looking aesthetics is evident in my results. A true sign of skilled hands. I have never looked & felt better.